We celebrated my mom's 74th birthday this past weekend with our close family and friends and this delicious vanilla layer cake. If you are ever in need of an impressive cake for a special occasion but don’t want to slave in the kitchen all day this cake is the one to make. I stumbled across this cake months ago on the Life, Love & Sugar blog and I immediately saved it knowing my mom would love it for her birthday. And I'm so glad that I did because it was a huge hit with the entire party. 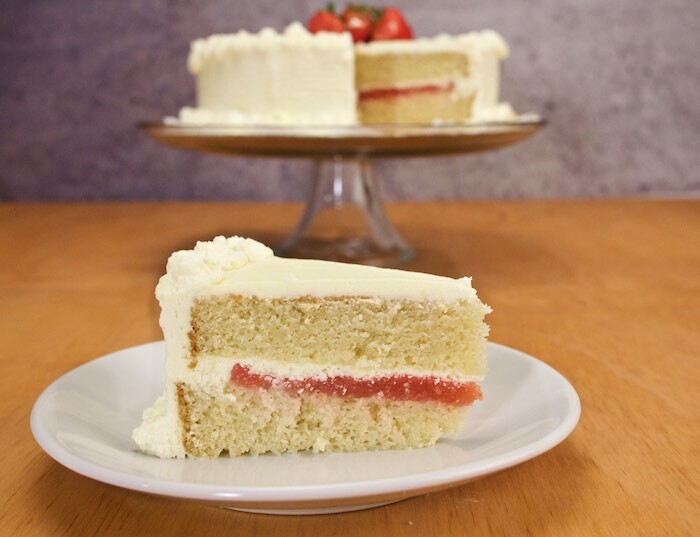 Since strawberries are my mom's favorite I decided to fill the moist vanilla cake layers with a delicious homemade strawberry jam. What really takes this cake over the top is the light and fluffy mascarpone frosting. 1. Preheat oven to 350°F (176°C) and prepare one tall 9 inch cake pan or 2 short ones with non-stick baking spray and parchment paper in the bottom. 2. Combine the flour, sugar, baking powder and salt in a large bowl and set aside. 3. Combine the milk, vegetable oil, vanilla extract and eggs in a medium sized bowl and combine. 6. Pour the batter evenly between the prepared cake pan(s) and bake for 1 hour (if using tall pan or 30 minutes if using short pan), or until a toothpick comes out clean. 7. Remove the cakes from oven and allow to cool for 2-3 minutes, then remove to a cooling rack to finish cooling. Use a cake cutter to split the tall cake into two layers. 8. Add the strawberries and water to a food processor and puree until smooth. 9. Combine the sugar and cornstarch in a medium saucepan. Stir in the strawberry puree. 13. Add the mascarpone cheese and whip until stiff peaks form. Allow to set in the refrigerator. 15. 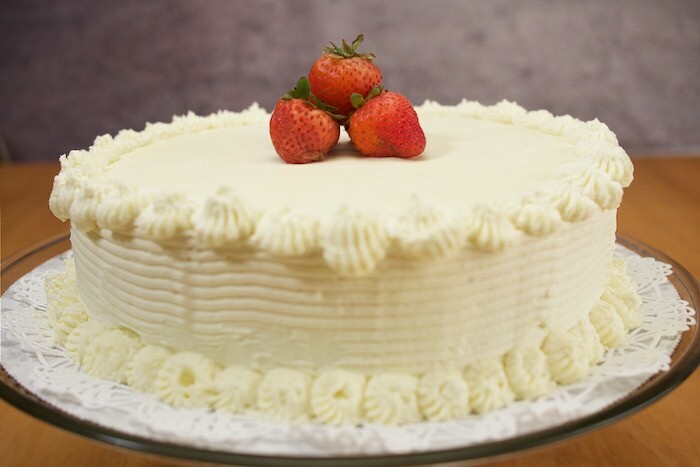 Place the first layer of cake on a serving plate or a cardboard cake round. Pipe a dam of frosting around the outside of the cake. 16. Spread the berry filling evenly on top of the cake layer, inside the dam. It should fill the dam. 17. Spread a thin layer of mascarpone frosting on the top of the berry filling and spread into an even layer. 19. Frost the outside of the cake, then use an icing decorator to add a striped pattern to the sides.